In Microsoft Project everything is scheduled "As Soon as Possible" by default. This is generally a good thing, though it is a bit misleading at times. It is very common for people to look at the schedule and see that something did not start on the "start" date and get concerned. Fortunately there is an easy way to tell whether a task starting late is a problem or not. The way to do this is to look at the Total Slack (also referred to as Total Float) for the task. This value shows you the amount of time that a task can move later in time without affecting the finish of the project. Project calculates this automatically for you by performing a forward pass calculation - adding up the durations of tasks going forward to determine how early they can finish, and then a backward pass calculation - the same thing but from the project finish date which was calculated in the forward pass. As a result of these calculations you get an early finish date and a late finish date for every task. The difference between the two is the total slack or float. The result of adding these barstyles is shown in the next diagram. You can see for the first group of tasks that Task D has total slack of one week. So if you are in the second week of the project and contemplating whether Task B or Task D is more important to get started on, the answer should be clear that it is Task B. The Neg Float bar comes into play when your tasks are already too late. In this case I set a "Must Finish On" constraint on the Finish milestone. In effect this makes Tasks A, B & C late by one day. You can see the red bar show up indicating that they are 1 day late. Task D is still showing 4 days of total slack. 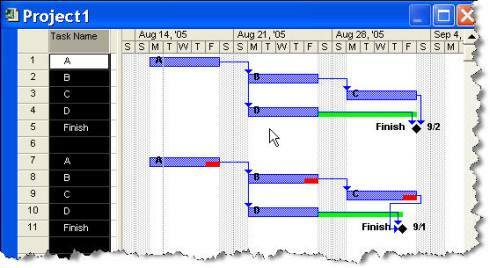 By making this information visible on the Gantt chart it is much easier to see what tasks are the ones which will affect your project completion and which tasks are less critical. Great tip. This is a constant point of discussion here. I'll use this style for some test projects. Our corporate standard has a different approach to displaying, but I like this better. This is a great help, i am having to compile a program for my Uni assignment and this has helped me to see the light! Many Thanks! Great Tip ! I will surely use it ! The previous article is More Myths. The next article is Clueless.